Seven gents and one lady from Ettrick Forest Archers travelled through to Mugdock Country Park on Sunday to take part in the last Scottish BLBS Clout event of the season. Unusually for Glasgow venue there was very little wind to contend with but what there was, was unpredictable. In the Ladies event the double round winner was Highland’s Barbara Campbell, with Green Hollow’s Emma Gillies and Elizabeth Normand winning the first and second round medals respectively. EFA archer Ev Craig came a creditable fourth with a season best of 40-103-2. The Ladies shoot off by ends was won by Eileen Bilby from Kilwinning archers. In the gents competition Green Hollow’s Scott Notman made a second half revival to overhaul EFA archer Jimmy Stillie for the double round. Jimmy however did get the first round medal for the morning session while Doug Anderson from EFA got the second round medal. In the shoot off by ends fourth placed EFA archer Martin Stillie Joined his dad Jimmy in the shoot off against Green Hollow’s Scott Notman and John Mckellar where Jimmy gained revenge on Scott by taking the shoot off medal. The awards for the Scottish Clout series were also made where archers scores across the season are tabulated to give an ultimate champion. Barbara Campbell from Highland Longbows was the lady champion while Scott Notman retained the gent’s title. 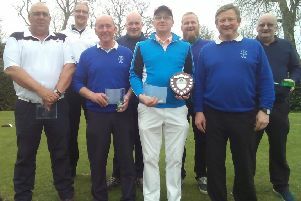 The silver platter for the gents best improved score over last year was won by Jimmy Stillie. Placings for EFA archers were: Gents (from 16) - 2, Jimmy Stillie; 3, Doug Anderson; 4, Martin Stillie; 9, Kevin Janiak; 11, Jim Craig; 12, William Good; 13, Rob Hale. Ladies (from 8) - 4, Ev Craig.